Showing results for tags ' leak'. Hi all, my second post here I got an old Yamaha 88 moto 4 and I have a problem with my overflow hose from the carb. When I put the gas switch to ON a big amount of gas is leaking from the overflow...so I start using my quad with the gas switch to RESERVE wich is also leaking but less than in ON position. I dont ride a lot..but in a week I empty my gas tank. Strange. I never clean my carb because Im new to quad world and dont have the service manual...so I need you point of view. Thanks guys! My 2000 suzuki quadrunner 500 has a leak at the rear of the crank case cover. You can see the oil very lightly spitting out when you look at it from the rear. I first found the bolt loose and I tighten it just lightly (I think they say 8 ft pounds). That stop part of the leak, but you can still see it coming out at the gasket between the two halves. I am mechanically inclined, but was just wondering if there are any surprises I might be aware of when I take off the pull cord assembly, shifter ext. Do you think there could be any other issues when I get it apart?? Doesn't appear to be any crack and I can see it just slightly spay out right in one little spot where the bolt is. Any help is appreciated. Good Afternoon! Woke up this morning to these pictures, how difficult a repair is this? I think this is just a seal? How do you get the driveshaft out to replace it? Sorry this is my first issue with this bike, trying to keep the cost down. Yes I am a noob! But I still require your assistance, I acquired a big bear and noticed the boot in the rear covering the drive shaft was leaking oil.... So I did some research and it looks like it could be the rear main seal or a loose yolk nut. So I took the liberty tearing the back end off the ATV and now what stands infront of me is the yolk nut. Leads me to my first question how do I even stick anything to tighten the thing it's nearly impossible and if it is tight how do I get anything in there to loosen it so I can replace the seal?? Please any help would be much appreciated! There is a slight oil leak on my quad runner it is where the cylinders connect to the engine i was wondering if there is any way to fix that? Last year i have changed the timing chain on my 1997 TRX350. I did use silicone between head and cover. now it is leaking. I am looking for a better product than silicone to put between cover and head. What should i use? I replaced the rear output shaft seal a year ago and it's leaking badly again. They are a pain to do because of the yoke being bolted to the shaft and the nut behind it. Has anybody seen this happen routinely to know if there may be something contributing to it like a bushing worn out on the output shaft that allows play? Also, any helpful hints as to how to get the nut off easier? Thank you. Gas leak under carb, have checked fuel line and is ok. Friend was riding it not knowing that the choke was on fully could that something to do with the leak? possibly needs the carb drained from float valve? if so how do you get to it in order to check?? HELP IN OHIO!! 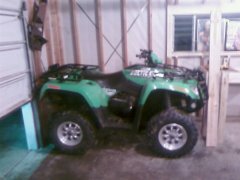 More SNOWis coming and I use my ATV to plow driveway!! Hi all, I bought this ATV not running, and while doing the leak down test found air leaking from a hole above the exhaust port on the cylinder head. Does anyone know what this hole is connected to? I have a repair manual, but it does not state anything about it. Could it be a part of the auto compression release mechanism? Any help would be much appreciated. Thanks. Ive got a 99 450s the top end was rebuilt about 2-3 years ago and ive had a slight oil leak for a while, but its gotten worse. I cleaned the motor up lastnight to see if I could tell where it was comin from, topped it off and went to do some food plot work on my hunting lease. all seemed fine untill it got hot enuff for the fan to kick on I ran it for about 10-15min after that and stopped to take a break and to let it cool off. I checked the oil again before gettin back to work and there was barely any on the stick, toped it back off and done it again, let it cool down a 2nd time and ran it about 2miles back home... any chance stop leak may help or atlast slow things down untill I get my plots done and then replace the gasket? what all am I lookin at as far as changing it out? Is it as simple as pull the top end off, clean the old off, replace and put back together or is it more involved? Ive never done any atv motor work thats why I ask....sorry for the dumb questions but thanks for the help! Hi, just rebuilt my engine (wiesco crank and rod kit, rings, new gasket kit top and bottom, valve stem oil seals, grinded valves) my problem is this, my head is leaking air from the right hand side(not the timing chain side) where the head meets the cylinder. I have a tusk head gasket on and it has a steel ring around chamber and the rest is like cork or paper. The original was all steel with some kind of sealant on it which I cleaned of everywhere. The head is torqued correctly as I stripped and built it again to check it but it's still the same. Has anybody else come across this? Do Warriors wrap their heads? 2005 Arctic Cat 500i Arctic Cat Fuel Leak?? I just bought 2005 Arctic Cat 500i 4x4 and noticed that when it is running or after it is shut off it leaks gas out of the bottom of the carb. any ideas? 525 Outlaw w/big oil leak! :aargh:My Outlaw is leaking oil out off the seem in the engine block just above the rear oil filter area and possible another spot in that seem. Anyone else had this problem? What would cause this? 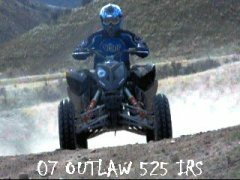 I thought KTM was suppose to be a good engine, thats the only reason I risk getting a polaris. Fuel Leak from Arctic Cat Carb Vent Hose Help! I installed a SuperTrapp Mudslinger and a K&N yesterday and took my AC 400 out for a test ride today to see how it was running. During my ride, I noticed a fuel leak that appears to be coming from the carb vent hose. The carb is bone stock, and hasn't been touched. I wanted to see how it was running before planning any jetting. What does this mean? How worried should I be? My 03' Lakota sport has never been taken apart but it's leaking oil. It's on the left side of the bike and looks like maybe the gaskets are failing. It doesn't seem to leak except when I am riding, and it's not enough that I have to add more, it just makes a mess of the bike. Anyone else had this problem? Should I get it taken care of asap? It doesn't leak while parked. It doesn't leak while running. It ONLY leaks while I am riding:huh:.